There is one chapter in the Flood manuscript that doesn't appear in Burns or Lake and smells like something Sadie Earp would cook up. The chapter is called "A Conflagration." Although no date is given, it is about our hero saving two women from a roaring fire which was started by a leaking "from the bulging side of a big, round barrel that lay lengthwise and close to the front of the establishment." This must be the June 22, 1881 fire that started in Alexander and Thompson's Arcade, three doors east of the Oriental Saloon. A condemned barrel of whiskey exploded while being tapped by an employee who was lighting a cigar. 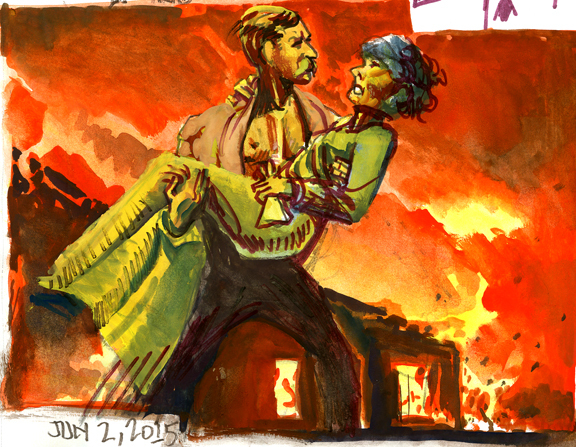 As the fire spreads, Flood (with Sadie over his shoulder) picks up the action. Someone yells "Fire!" and Earp begins gathering up the money [$10,000] "while the smoke poured in at the front and the paint on the wainscoting peeled clean from the heat of the conflagration next door." Everyone flees except our hero who goes into the back office to save the money. We might assume this was the Oriental Saloon where Wyatt had an interest, but no one says this, or gives any other location throughout the long and belabored action. His brothers are there and they are worried about Wyatt: "Those who had seen him last reported that he had disappeared in the smoke in an effort to get to the safe. Virgil and Morgan Earp were almost beside themselves as the flames commenced to dart from the upper part of the building." Daily Whip Out: "Tombstone Fire #2"
Morgan and Virgil strip off their coats and get down on their hands and knees to go inside and try to find their brother. "The building was burning like tinder and the top was a pillar of flame. Embers began to fly aloft; the breeze picked them up and carried them on. Another wall of smoke belched through the doorway; it shot out into the throng and made them press back. 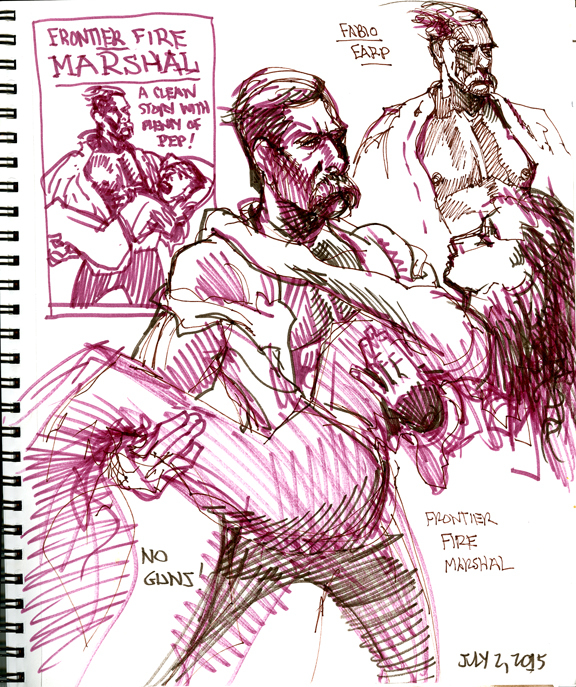 Then as it lifted, the two Earps stumbled out into the air." This reads surprisingly better than anything else in the manuscript and seems lifted from somewhere else, perhaps a story from a book Sadie brought to the table? Wyatt, of course, makes it out alive and now we go to another set piece that was so popular around the turn of the century: "A new danger now arose. . ." As the fire spreads to the next block a cry is heard: "Help!" "Help!" "Won't some one help me!" [Flood insists on these quotes within quotes and then has an exclamation instead of a question mark. He does this all the way through the manuscript.] Everyone stands around helpless, but Wyatt Earp "plunges through an open doorway" and to the rescue of not one, but two women. He had to go in twice, "How Earp got back to the second story again, he never knew." When he gets them safely outside, "some one threw her arms around his neck and kissed him. Beyond that, the thread of the story seems to have been lost. If that were the beginning of a romance, Earp has been careful to guard the secret all these years." End of the "Confragration" chapter and on to "Johnny Behind the Deuce." Daily Whip Out: "Fabio Earp Saves The Day"
Daily Whip Out: Cover Study "Frontier Fire Marshal"
"Writing is hard work. A clear sentence is no accident." 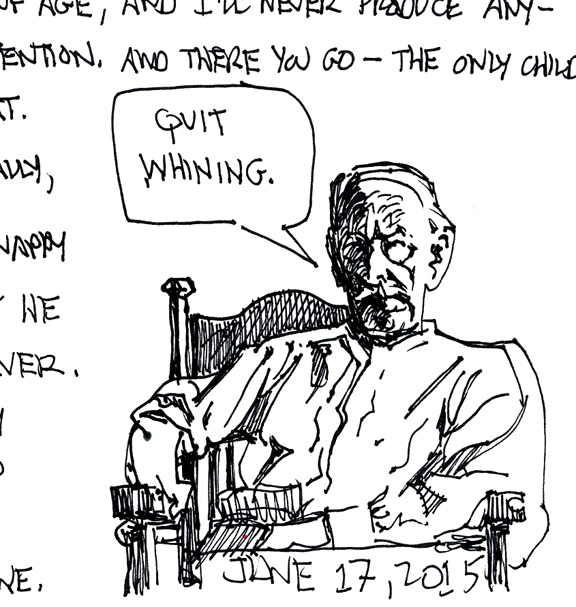 —William Zinsser, "On Writing Well"
Love the "Quit Whining" drawing. Need a poster of same. Wyatt was made secretary of the Tombstone fire brigade after the big blaze, so maybe there's some truth to this story?